By administrator in IMC Exploration Group (IMCP) on 15th January 2016 . We cannot identify the specific volcano responsible for the region’s volcanic rocks: it is either buried deep underground and out of sight or it was destroyed by subsequent geological events. But we do know it dominantly spewed out ashes, because plentiful evidence of them remains in the rocks around Avoca. Low viscosity magma like basalt will usually give rise to lavas that flow downhill with the speed and consistency of thick broth. Rhyolitic and similar high-viscosity magma, on the other hand, is generally very gas-rich and erupts explosively. Avoca’s magma was predominantly of rhyolitic composition and so gave rise to ashes. Ash clouds would have billowed skywards from the volcanic crater and spread out over the surrounding seas, dropping their ash loads onto the sea floor. The ashes became incorporated into seabed-hugging and sediment-charged water currents called turbidity currents, which surged rapidly downslope and lost their sediment load when they reached flat-lying seafloor in water depths of about 200 metres. Thus developed the sediments that now form the bulk of the Avoca rock sequence. So where would Avoca’s volcano fall on the scale of recent volcanic eruptions? Probably somewhere in the middle, outshone by examples such as Mount St Helen’s and Krakatoa. Think of the 1990’s Montserrat eruptions in the Caribbean in order to imagine the overall scale and setting. But where are the metals for which Avoca (and indeed Croghan Kinshelagh) is famous? 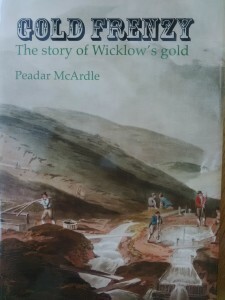 We know that mining took place in the vicinity of the Vale of Avoca since at least 1720. The suggestions of earlier outputs of metals extend back to Ptolemy’s time but alas are based on speculation, however tantalising. The recorded Avoca production amounts to 16 million tonnes of copper ore containing 0.6 percent copper and 5 percent sulphur. 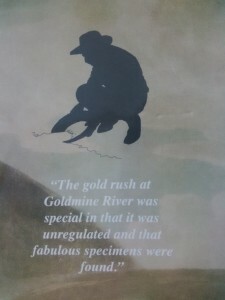 Even more prolonged, but on a smaller scale, was the output of iron ore from the Ballycoog-Moneyteige ridge on the northwest flank of the Goldmine River Valley. These workings are believed to have been operated by the Vikings and I have a suspicion their output may have been used in the Dublin of their era.